This week is very special for our volunteer Ambassadors for two reasons. 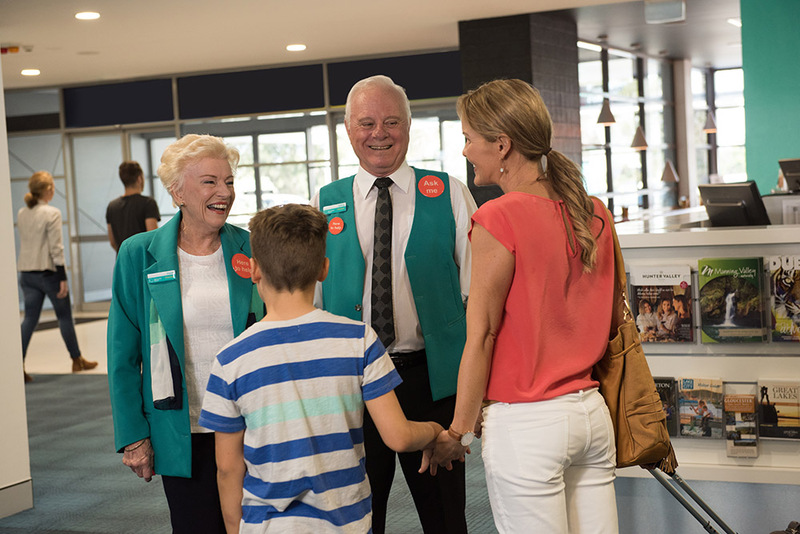 It is National Volunteer Week 2018, and the Newcastle Airport Ambassador program is celebrating its 10th anniversary. Starting as a group of four volunteers, the Newcastle Airport Ambassador program has since grown into an award-winning group of 13 generous volunteers. During this time, our committed Ambassadors have collectively donated more than 50,000 hours of their time to greet over 11.8 million travellers to Newcastle Airport. Some of these visitors have even included international celebrities like Lady Gaga, Lorde, and Andre Rieu! Making sure you have an enjoyable visit to Newcastle Airport. When asked what they enjoy most about volunteering at Newcastle Airport, our Ambassadors say it all comes back to their love for the region and helping the local community. Laraine, a volunteer since the start of the program, says, “I love making a difference to people’s experience at the Airport; an enjoyable one will ensure people keep coming back to our amazing region”. Similarly, fellow 10-year Ambassador Diane says there is “nothing nicer than a returning passenger saying, ‘Hi, you helped me...’”. While helping our travellers, our Ambassadors have also picked up a few travel tips, from the general (“Pack light”; “Prepare early”), to the curiously specific (“Limit alcohol intake”; “Don't drink too much alcohol”; “Have a cup of coffee or tea…not alcohol.”). Most important, though, is what it says on the Ambassadors’ badges: They’re “here to help”- so don’t be afraid to ask! Next time you’re at Newcastle Airport and need some assistance, or just want a friendly chat or tip, be sure to say ‘hello’ to our Ambassadors in teal jackets. Newcastle Airport would also like to extend sincere thanks to all volunteer Ambassadors, past and present, who have volunteered their time and energy into making Newcastle Airport welcoming and friendly every day.